When I was approached by Karyn at Ampersand Art Supply earlier this year to create some demonstrations of me working with their wonderful products for their YouTube channel, I was really excited. I love to paint in hot wax and have used the Encausticbord panels and cradle in the past when I reviewed the R&F Handmade Paints Starter kit on this blog last year and the kit included some of the panels and a cradle. The Encausticbord has not been readily available in the UK other than in the kits as far as I am aware, but I am informed that Ampersand Art Supply who are based in Buda Texas, are looking to have UK supplier later this year. 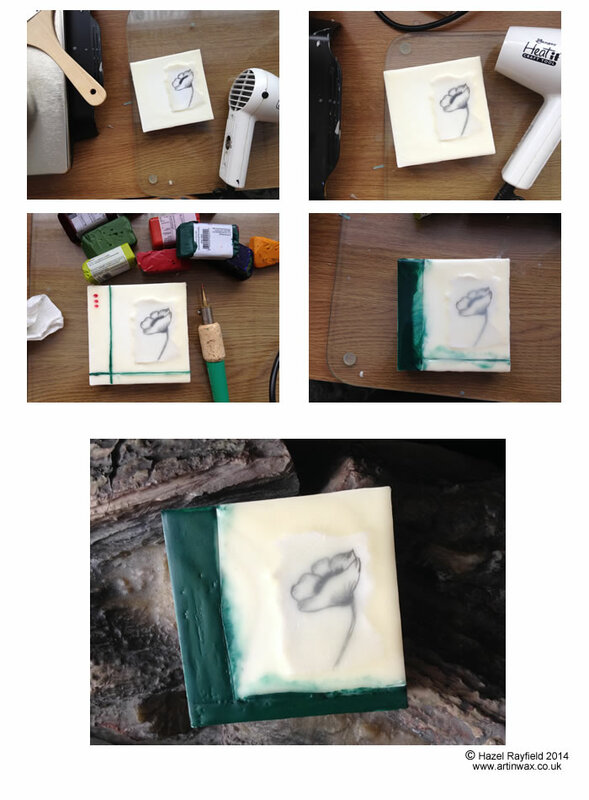 If you have read my blog before you know that I love to see what can be done in hot wax and I love to challenge myself and try new things, so when this opportunity came I was very excited to be working with Ampersand and with these wonderful encaustic supports. This is what Ampersand Arts Supply say about Encausticbord ……. This creative collaboration began in 2008 when the two manufacturers, authorities in their respective fields of wood painting panels and encaustic paint colors, started working together to dream up the perfect surface for encaustic paints. This combination of Ampersand’s archival panel coating technology and R&F’s expertise in encaustics led to Encausticbord™, a unique wood panel that has the tooth to hold encaustic and mixed media unlike any other surface. My husband Adrian, a great amateur photographer in his own right, filmed as I painted. We are not professional film makers, we got the giggles a few times and had a few out-takes too …… but I have a passion for painting Art In Wax and I hope this comes over in the videos. I am using the wonderful and amazing colour wax paints by R & F Paints in these films. This film shows me working on an Encausticbord cradle which is 6 x 6 inches and a prefect size for this subject, in this film I demonstrate the stages of how I painted a Sunflower head. 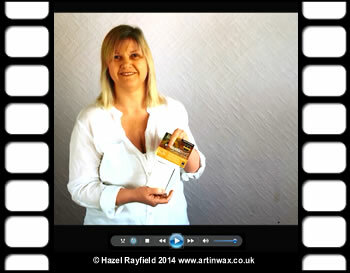 The video can be watched here : Ampersand Art Supply : Hazel Rayfield Cradled Encausticbord. In this film I demonstrate the techniques working in miniature, onto Encaustic ACEO / ATC 2.5 x 3.5 inch size Encausticbord panels which are great fun to work with. Here I create three pieces using different styles and technique, from painting directly onto the surface, to a mixed media piece and a colorful abstract. The video can be watched here : Ampersand Art Supply : Hazel Rayfield Artist Trading Cards in Encaustic. These are the finished pictures, this is been a great challenge / project. 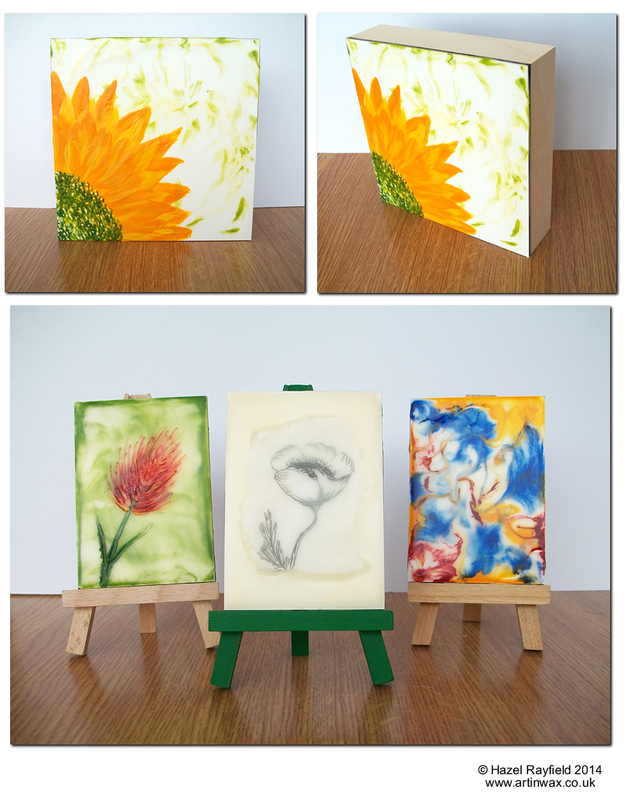 Ampersand Art Supply and their products have made painting my Art In Wax a pleasure. This has been a great fun project, I hope you like the videos and watching me paint in this style of hot wax. If you would like to comment below that would be great. I have been in my studio today painting wax on wood using the wonderful R & F Handmade Paints wax paints. I do love to experiment in wax and today I decided to try out something a bit different and use some mixed media in my work and I thought it would be fun to take some photos along the way and show how things went. I have the hotplate fired up and all my wax melting, I am working on a 4 x 4 panel which I have gessoed, using the R&F specialist encaustic gesso, which I really like as it is easy to use and I have masked the sides of the panel as I like to keep them clean and have the natural wood look in the finial piece. I then layered a couple of coats of clear medium to prime the surface, fusing with my hot air tool in and between layers. Having made a pencil drawing of a poppy style flower and torn the edges of the paper to give a rustic effect I am ready to start. 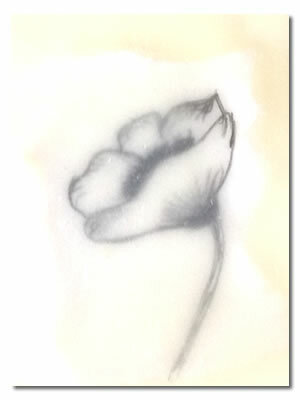 I heated my primed surface and laid on my drawing, the paper started to soak up the wax. A layer of clear wax then sealed it in place, it is not flat and has a great wax texture. Cutting into the wax with my stylus gave some lines and I was going to add some red dots, but with all things creative, I changed my mind and decided I liked the effect of the heat on the green so added more. The green wax gives a border to the piece and is thicker than I normally have in my work, but it worked well with the rustic feel of the poppy and the paper. This is a much more rustic piece than I normally do in my work, but it was fun and I will use elements of this in future work, I especially like the softness of the wax on the poppy drawing ….. what do you think? If you have read my blog before you will know I have recently started to paint using some wax paints from R & F Handmade Paints, this post shows how I have my studio set up when working with these paints on a wood panel. 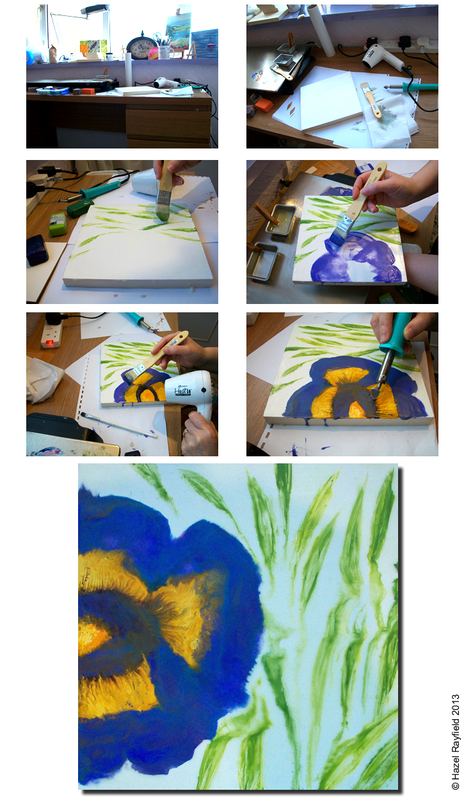 This is a different paint from the wax blocks I use on my gloss card pictures, this new pansy painting has deeper layers of wax too and can take several months to cure and fully harden. I was inspired to paint this picture, as we come into Autumn here in England and see the winter pansies come into their own, bringing some colour to the garden. I thought it might be fun to take a series of pictures as I worked on this piece, which is an 8 x 8 inch wood panel, which I prepared with encaustic gesso and masking taped the sides to keep them clean. Below you can see my work area and how I use the hot plate as a platte as I work with the wax, layering wax with brushes and fusing with my hot air tool, then added some fine detail with my heated stylus ……. The colours of this are amazing I think you will agree ?